*According to the Canadian Sedentary Behaviour Guidelines for the Early Years (0 – 4 years): For healthy growth and development, caregivers should minimize the time infants (aged less than 1 year), toddlers (aged 1–2 years) and preschoolers (aged 3–4 years) spend being sedentary during waking hours. This includes prolonged sitting or being restrained (e.g., stroller, high chair) for more than one hour at a time. For those under 2 years, screen time (e.g., TV, computer, electronic games) is not recommended. For children 2–4 years, screen time should be limited to under one hour per day; less is better. 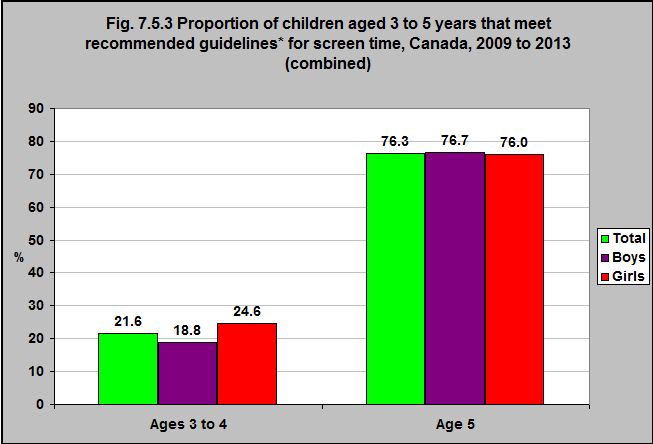 For 5 year olds screen time should be limited to no more than 2 hours per day. http://www.csep.ca/view.asp?ccid=508 – accessed June 22, 2017.